One of the great treasures of the National Gallery is Leonardo da Vinci's The Virgin of the Rocks. The masterpiece has recently been cleaned, leading to the cautious conclusion of the curator that "it now seems possible that Leonardo painted all the picture himself". 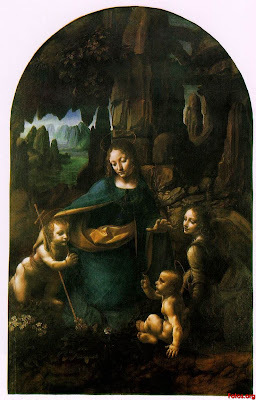 In a fascinating article for the Guardian: The Virgin of the Rocks: Da Vinci decoded, Jonathan Jones shares his enthusiasm for the painting itself: "Once you've seen it, everything else in this collection looks like flat daubs.") and the restoration: "Conservative this restoration may be in style, but its implications are revolutionary." Telegraph blogger, Harry Mount Harry Mount also has a warm appreciation of the restoration which overcame his "ingrained scepticism about over-cleaning". It is a great privilege to be within close reach of such treasures in London. I will be slogging through the transport network this evening on my way to Lichfield, but will not have time to stop off at Trafalgar Square. I do have an engagement up in town within the next two weeks, however, and will add in a little extra time to pop in to the National Gallery.